gDepartment of Neuroradiology (D.H.), Centre Hospitalier Universitaire Tours, Tours, France. BACKGROUND AND PURPOSE: Endovascular treatment of wide-neck anterior communicating artery aneurysms can often be challenging. The Woven EndoBridge (WEB) device is a recently developed intrasaccular flow disrupter dedicated to endovascular treatment of intracranial aneurysms. The aim of this study was to investigate the feasibility, safety, and efficacy of the WEB Dual-Layer and WEB Single-Layer devices for the treatment of wide-neck anterior communicating artery aneurysms. 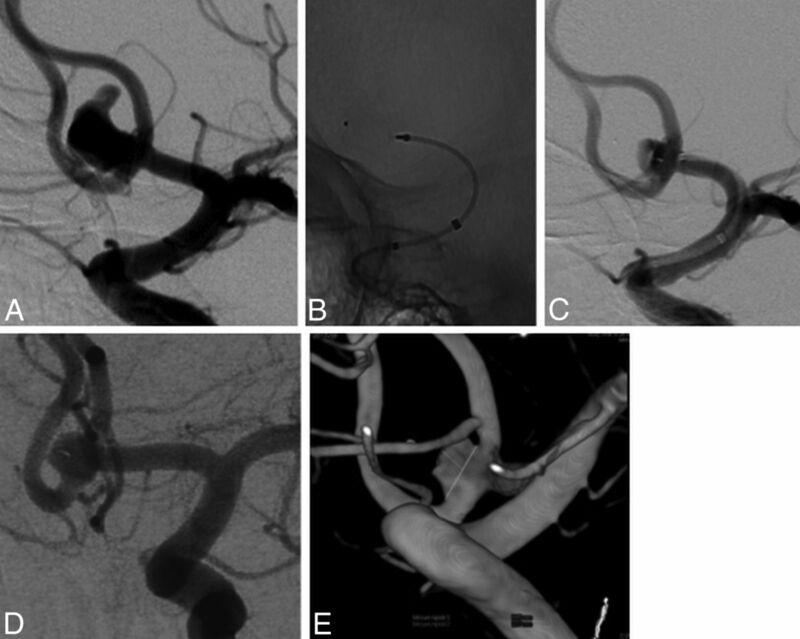 MATERIALS AND METHODS: Patients with anterior communicating artery aneurysms treated with the WEB device between June 2013 and March 2014 in 5 French centers were analyzed. Procedural success, technical complications, clinical outcome at 1 month, and immediate and 3- to 6-month angiographic follow-up results were analyzed. RESULTS: Ten patients with unruptured anterior communicating artery aneurysms with a mean neck diameter of 5.4 mm were treated with the WEB. Treatment failed in 3 of the 10 aneurysms without further clinical complications. One patient developed a procedural thromboembolic event, and the other 6 had normal neurologic examination findings at 1-month follow-up. Immediate anatomic outcome evaluation showed adequate occlusion (total occlusion or neck remnant) in 6 of 7 patients. Angiographic control was obtained in all patients, including 6 adequate aneurysm occlusions (3 complete occlusions and 3 neck remnants) at short-term follow-up. CONCLUSIONS: In our small series, treatment of wide-neck anterior communicating artery aneurysms with the WEB device was feasible and safe. However, patient selection based on the aneurysm and initial angiographic findings in the parent artery is important due to the limitations of the WEB device navigation. The Woven EndoBridge (WEB) aneurysm embolization system (Sequent Medical, Aliso Viejo, California) is a recently developed intrasaccular flow disruptor dedicated to intracranial wide-neck aneurysm management; to date, WEB Dual-Layer (WEB-DL) feasibility, safety, and short-term angiographic findings have only been reported in a few studies, mostly in aneurysms of the middle cerebral artery, while its feasibility and results in treatment of anterior communicating artery aneurysms are not well-known.14⇓⇓⇓–18 The characteristics of the WEB device combining a large-diameter microcatheter and a relatively stiff device may hamper its placement in this location. The goal of this study was to analyze the feasibility, safety, and efficacy of WEB-DL and WEB Single-Layer (WEB-SL) flow disruptors for the treatment of wide-neck anterior communicating artery aneurysms. Between June 2013 and March 2014, patients with anterior communicating artery aneurysms in 5 French centers were treated by using a WEB device. Patient selection was made by the interventional neuroradiologists of each center according to the aneurysm location, size, and neck diameter. Patients were selected for the WEB device when their wide-neck aneurysms necessitated an adjunctive technique such as Y-stent placement. In these situations, we chose to use an intrasaccular device rather than other techniques. Ethics committee approval from each center was obtained for this prospective study. All patients signed an informed consent. We used 2 types of WEB devices: the DL and SL. The WEB-DL is composed of inner and outer nitinol braids held together by proximal, middle, and distal radiopaque markers, thereby obtaining 2 separate compartments, 1 distal and 1 proximal (Fig 1A). The WEB-SL is composed of only 1 nitinol braid held together by 2 markers (Fig 1B). The WEB device is deployed in a manner similar to that of endovascular coils via the use of a ≥0.027-inch internal-diameter microcatheter. The detachment system is electrothermal and instantaneous. The WEB device is CE-approved for use in unruptured and ruptured intracranial aneurysms. A 65-year-old man with an unruptured anterior communicating artery aneurysm. A and B, Angiography shows a wide-neck anterior communicating artery aneurysm. C, End-procedure angiography shows satisfactory occlusion of the aneurysm with a neck remnant. D, Unsubstracted lateral view shows the WEB device. E and F, Follow-up angiography at 6 months shows complete aneurysm occlusion. All procedures were performed with the patient under general anesthesia and systemic heparinization. Unilateral femoral access was performed, and the tip of the long sheath was placed in the left or right common carotid artery. A coaxial system was assembled, and the aneurysm was catheterized with a Rebar 27 (Covidien, Irvine, California), Marksman 27 (Covidien), or DAC 038 (Concentric Medical, Mountain View, California). The WEB device chosen according to the aneurysm diameters was then deployed into the sac. After deployment, a control angiogram was performed to check the position of the device in the aneurysm. If the position or the size was not satisfactory, the device was then resheathed and repositioned or resheathed and replaced by another, more suitable device. Clinical outcomes were assessed at discharge and 1 month by using the modified Rankin Scale.19 Morbidity was defined as an mRS score of 2–5. Ten patients (4 women and 6 men; mean age, 59.3 years) with unruptured anterior communicating artery aneurysms were included. The mean width size was 6.2 mm (range, 3.5–8.1 mm), the mean dome size was 5.8 mm (range, 3.8–8.2-mm), and mean neck size was 5.4 mm (range, 3.6–8-mm) (Table 1). Successful deployment of the WEB was obtained in 7 patients (with 2 WEB-DLs and 5 WEB-SLs). In all successful cases, the aneurysms were treated with a single device. In 3 patients (patients 1, 4, and 5), WEB deployment failed. In case 1, the device could not be advanced beyond the carotid bifurcation due to unfavorable vascular anatomy conditions, which led to instability of the microcatheter; the aneurysm was then successfully coiled. In case 4, correct WEB deployment was achieved, but on control angiograms, suboptimal positioning of the device was seen with its base protruding through the neck of the aneurysm inside the parent artery. A second, 6 × 3 mm, WEB-DL device was than deployed, again with suboptimal positioning. The aneurysm was then treated with a balloon-assisted coiling technique. In case 5, WEB-deployment failure occurred due to difficult microcatheter navigation through the A1 segment of the anterior cerebral artery; the aneurysm was later coiled successfully. No intraoperative aneurysm rupture was observed during WEB deployment. In 1 patient (patient 2), the base of the WEB protruded into the lumen of the left A2 segment through the aneurysm neck, a balloon was used to push the WEB inside the aneurysm, and a distal thromboembolic event later occurred in branches of the ipsilateral anterior cerebral artery. At 1 month, the patient had an mRS score of 1. Clinical outcomes are summarized in Table 2. Six (85.7%) of 7 patients with successful WEB deployment were asymptomatic at 1-month follow-up (mRS 0). One patient presented with posttreatment right-sided hemiparesis (patient 2) due to a distal left A2 thromboembolism found later on follow-up MR imaging. At 1 month, the patient recovered most of the deficit with a mild brachial deficit remnant (mRS 1). No treatment-related mortality was observed (0.0%); posttreatment permanent morbidity was 0.0%. At the end of procedure, 6 of the 7 patients (85.7%) achieved satisfactory occlusion (complete occlusion or neck remnant). Two patients had complete occlusion, and 4 were found to have a neck remnant. All of the 7 patients with successful WEB deployment were assessed at short-term follow-up (3–6 months) by using either conventional angiography (6 cases) or CTA (1 case); satisfactory occlusion was seen in 6 patients (85.7%). A 65-year-old man (patient 7) presented with a 8.2-mm wide-neck anterior communicating artery aneurysm seen at angiography (Fig 1A, -B). Endovascular treatment with a 7 × 6 mm WEB-SL device was performed (Fig 1C, -D). Good clinical outcome was recorded after treatment, and a 6-month follow-up angiogram showed complete occlusion of the aneurysm (Fig 1E, -F). A 54-year-old woman (patient 4) presented with an incidental finding of a 4.8-mm wide-neck anterior communicating artery aneurysm (Fig 2A). Endovascular 6 × 3 mm WEB deployment was performed, and postprocedure angiography showed suboptimal positioning of the device with protrusion of its base through the neck of the aneurysm and residual contrast filling of the sac. A second 6 × 3 mm WEB-DL was deployed, but control injections again revealed suboptimal positioning (Fig 2B, -C). A decision was made to coil the aneurysm (Fig 2D), and 3-month MRA follow-up showed complete aneurysm occlusion (Fig 1E). A 54-year-old woman with unruptured anterior communicating artery aneurysm. A, 3D angiography shows a 4.8-mm wide-neck 6-mm-long anterior communicating artery aneurysm. B and C, Unsuccessful deployment of a WEB-DL device occluding the origin of the left anterior cerebral artery. D, Complete aneurysm occlusion after coiling. E, Follow-up MRA at 3 months shows complete occlusion of the anterior communicating artery aneurysm. A 46-year-old man (patient 10) presented with an incidental anterior communicating artery aneurysm. Angiography revealed a 5.4-mm wide-neck anterior communicating artery aneurysm (Fig 3A). Endovascular treatment was performed by using a WEB-SL device with final incomplete aneurysm occlusion (Fig 3B, -C). Angiographic follow-up at 6 months revealed incomplete occlusion of the neck (Fig 3D, -E). A 46-year-old man with an anterior communicating artery aneurysm. A, Angiography shows a 6-mm wide-neck 8-mm-long anterior communicating artery aneurysm. B and C, A 7 × 5 mm WEB-SL device is successfully deployed. 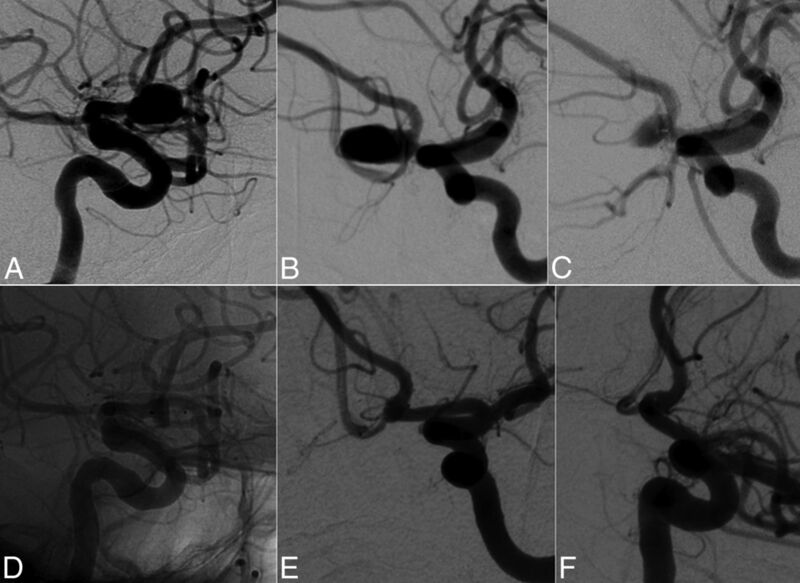 D and E, Six-month follow-up angiography shows a significant neck remnant. 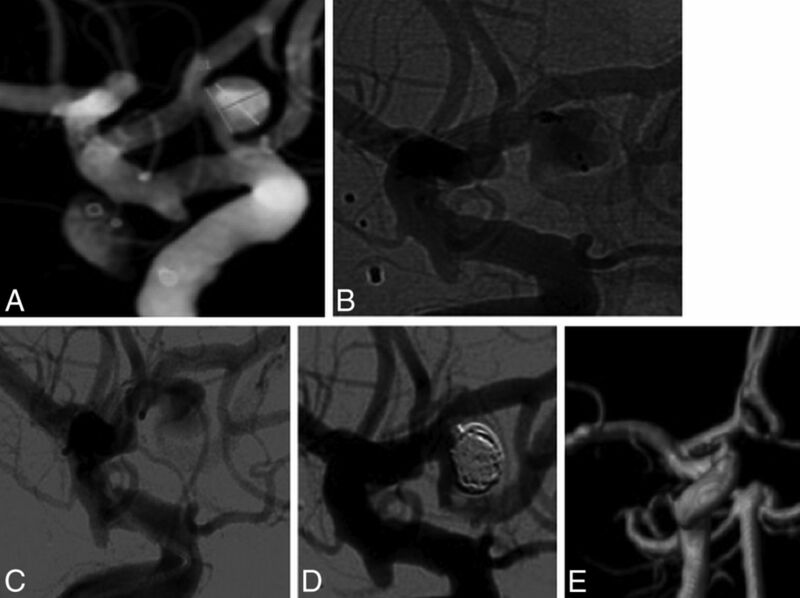 This small series shows that endovascular treatment with WEB-DL and WEB-SL devices is feasible in wide-neck anterior communicating artery aneurysms, with very low morbidity and mortality and a high adequate occlusion rate at short-term follow-up. We show that treatment of anterior communicating artery aneurysms with a WEB device is feasible; however, selection of patients should be taken into account before deciding on a WEB treatment. In this series, the rate of failure was not negligible (30%). WEB treatment of anterior communicating artery aneurysms requires a favorable angle between the long axis of the aneurysm and that of the parent vessel (A1 segment of the anterior cerebral artery) as reported by Lubicz et al.15 An unfavorable anatomy may lead to prolonged interventional timing and/or impossible WEB deployment. We observed 1 deployment failure (patient 4) because the long axis of the aneurysm was not in line with that of the parent vessel, and after several failed attempts to place the microcatheter, it was decided to coil the aneurysm. In addition, a favorable angle between the centerline of the A1 segment of the anterior cerebral artery and the terminal internal carotid artery is also important (patient 5). The use of a much larger and stiffer microcatheter for the WEB device than usually used for coiling is currently mandatory. Wide-neck intracranial aneurysms can be treated with stent-assisted coiling4,5; however, in case of bifurcation aneurysms such as anterior communicating artery aneurysms, the stent placement procedure requires a Y- or X-configuration, which has a high incidence of adverse events and outcomes.11⇓–13 Compared with intracranial stent placement, the major advantage of using a WEB device is the absence of antiplatelet therapy. In our series, no antiplatelet premedication was performed except in 1 patient with an iliac artery stent placement. The use of antiplatelet therapy is known to increase the risk of hemorrhagic complications.7,11,13 In a survey that included 1517 patients treated with stents, Shapiro et al7 reported an overall procedure complication rate of 19% and a periprocedural mortality of 2.1%. However, the rate of neck remnants is not negligible, and the concave base of the WEB device could explain these findings. This high rate of neck remnants could also be explained by the compaction of the device toward the dome. Further technical improvements may be needed to ameliorate the occlusion caused by the device. Long-term follow-up of these patients is mandatory to verify its efficacy precisely. In addition, the efficacy of the WEB-device treatment in terms of aneurysm recanalization according to the type used (WEB-DL or WEB-SL) is not well-known; therefore, mid- and long-term follow-up are needed. The limitations of our study were the small number of patients and a follow-up period that was too short to evaluate the efficacy of the WEB device. However, it is important to have a preliminary evaluation for this new endovascular treatment device for anterior communicating artery aneurysms. In this small series, we found that the WEB device may be a new treatment option for wide-neck bifurcation anterior communicating artery aneurysms. Angiographic findings of the aneurysms and the parent artery are crucial to improve the feasibility of the WEB device. Nevertheless, the rate of neck remnants is not negligible and necessitated improvements of the device technology. D.N.G. and B.G. contributed equally to this work. Disclosures: Laurent Pierot—RELATED: Consulting Fee or Honorarium: Sequent Medical; UNRELATED: Consultancy: Codman, Covidien, MicroVention, Balt, Stryker Neurovascular. Xavier Barreau—RELATED: Consulting Fee or Honorarium: Sequent Medical, Comments: honorarium for filling my Web case data base. Denis Herbreteau—RELATED: Consulting Fee or Honorarium: Sequent Medical (proctoring); Support for Travel to Meetings for the Study or Other Purposes: Sequent Medical. Francis Turjman—UNRELATED: Consultancy: Codman. * Balt, Covidien; Payment for Lectures (including service on Speakers Bureaus): Codman,* Covidien*; Payment for Development of Educational Presentations: Codman, Balt*; Travel/Accommodations/Meeting Expenses Unrelated to Activities Listed: Covidien, Codman. *Money paid to the institution. Accepted after revision December 14, 2014.